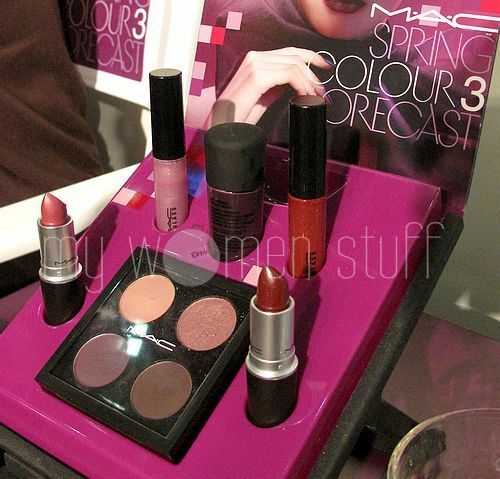 Home » New on shelves » MAC Cosmetics Spring Colour Forecast – What’s your colour? MAC Cosmetics Spring Colour Forecast – What’s your colour? 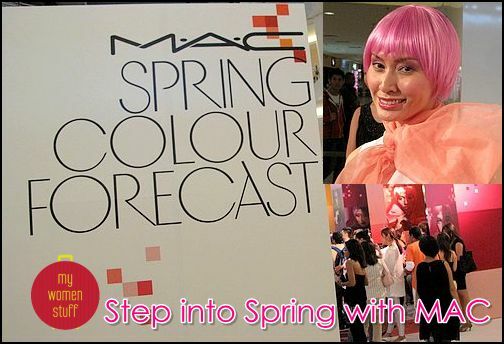 MAC Cosmetics launched their Spring Colour Forecast collection just this Wednesday at MidValley Megamall in a colorful fiesta. You can spot it in the MAC stores already and if you are a fan of MAC products, you would already know about this. 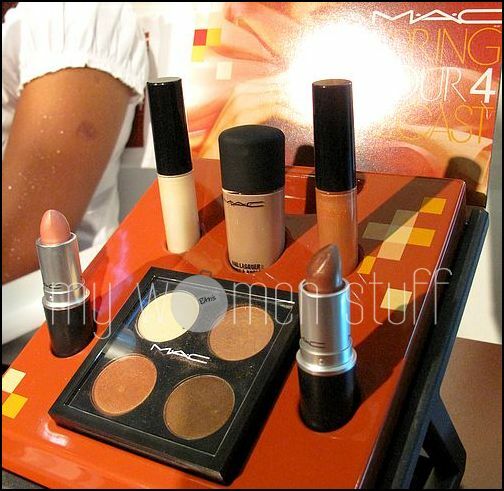 Spring 2010 for MAC is a huge affair if the collection is anything to go by. There are 4 mini collections within the main Colour Forecast collection which can be mind boggling unless you are systematic. I’ve got some pictures for you so be warned that this is a picture heavy post. Do not attempt to download if you are on dialup – but wait. Who is on dial up these days?! 😛 With that dire warning given, let’s start then shall we? Colour Forecast 1 is pink/lavender based and is a rather large collection as you can see with eyeshadow singles, lipsticks, nail colours, pigments, fragrance and mascara – whew! Also look at the Blush Ombre 2 toned blush in Azalea Blossom (RM105). Its very pink-purple and definitely one for the cool toned girls. 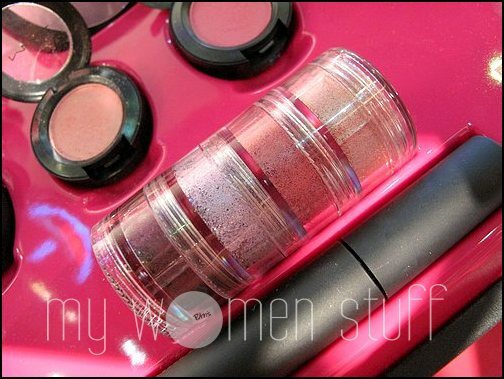 My eye was caught by the Crush Metal Pigmented in Stacked 1 which is a set of 4 pigments selling as one (RM135). You know, MAC should have done this or something similar years ago! However, the container reminds me of something you can buy from a supply store (which I have) and from experience, these acrylic containers break easily and get brittle after a while. MAC SA on hand agreed with me 🙂 Props to MAC for coming up with this idea but perhaps they might want to find a more durable container. I liked the 4 cool pink toned colours which is a first for me. It was too crowded on the launch day so I’ll go back and check it out in a couple of days to see if I really like it enough to buy it 😛 You’ll have to click on further down for the rest of the collection. Please insert small scream of horror here. My photos of the collection did not pass muster, I’m sorry 🙁 Its all blurry and grainy and ick! 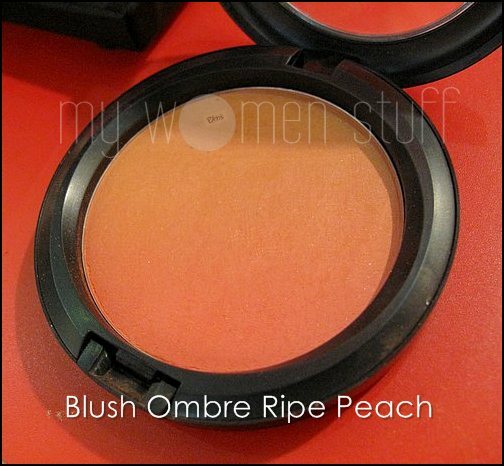 But I do have a picture of the Blush Ombre in Ripe Peach. This is the infamous one that’s been sold out on the MAC website in like erm… forever? 😛 Online rave reviews are sending MAC’s Ripe Peach blush flying off the shelves! The colour is stated to be Light Coral and its a pretty little thing with the gradational colour that reminds me of a sunset. I’m longing to hit the beach if you can’t tell. Perhaps even get a tan so I can wear this coral blush without looking like a pumpkin. Problem is, I don’t tan – urgh! Another item in this line that struck me was the MV2 fragrance – a warm cookie batter dough smell that is great if you like foody scents but not so great if you don’t. Yani liked it, I wasn’t so thrilled 😛 There is also a Crush Metal Pigment in Stacked 2 which is 4 metallic golden toned pigments. Not very interesting to me unlike Stacked 1. If you are the dark seductive sensuous type, this might be your collection. Colours are plum toned and deep and look luxurious and plush. I like the look of that Imperial Splendor nail lacquer (RM42). Even the name sounds luxurious! And MAC is finally going back to their 4 pan quads! I sorta missed those because I used to have a ton before I gave them all away. Strictly for warm toned girls only. Colour Forecast 4 reminds me of the desert with dusky sloe eyed beauties with eyes rimmed in kohl peeping out at you from behind their silken head coverings. PREVIOUS POST: Lancome Oscillation Powerfoundation – Feel the vibration? i still haven’t got the heart to use them, i worry the gradation disappears and i leave with only a chunk of colour! I bought the Azelea Blossom, eye shadow in da bling and victoria lipstick…. Sorry for the amateur question – how do i know if i’m cool or warm toned? really? silver suits me better but i’ve always thought asians were warm-toned, u know yellowish undertones..
You can be asian and still be cool toned 🙂 Some of us have pinker tones than others. Unless you have very obvious yellow skin my experience is that most people are only marginally warm toned but if you are very fair, then you are likely neutral. If you do, you might like the fragrance. Its surprisingly affordable although its a small bottle. how much is the eyeshdows in quad?? i am so excited with this collection (and Too Fabulous too!). going to pick up some stuffs earlier. Whoppy !!! i can imagine myself going hyper at the store.. hehe..
i love colours of SPRING! i’m also eyeing other brands for their SPRING collection! i bought the plum blush and pink pigments, as recommended by the MA. love them. sadly the popular peach blush made me look v orange and sallow. Yup that peach blush is way too warm for me too!